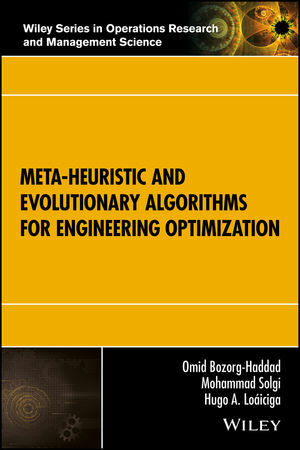 This book introduces the main metaheuristic algorithms and their applications in optimization. It describes 20 leading meta-heuristic and evolutionary algorithms and presents discussions and assessments of their performance in solving optimization problems from several fields of engineering. The book features clear and concise principles and presents detailed descriptions of leading methods such as the pattern search (PS) algorithm, the genetic algorithm (GA), the simulated annealing (SA) algorithm, the Tabu search (TS) algorithm, the ant colony optimization (ACO), and the particle swarm optimization (PSO) technique. Relates optimization algorithms to engineering problems employing a unifying approach. Meta-heuristic and Evolutionary Algorithms for Engineering Optimization is a reference intended for students, engineers, researchers, and instructors in the fields of industrial engineering, operations research, optimization/mathematics, engineering optimization, and computer science. OMID BOZORG-HADDAD, PhD, is Professor in the Department of Irrigation and Reclamation Engineering at the University of Tehran, Iran. MOHAMMAD SOLGI, M.Sc., is Teacher Assistant for M.Sc. courses at the University of Tehran, Iran. HUGO A. LOÁICIGA, PhD, is Professor in the Department of Geography at the University of California, Santa Barbara, United States of America. Hugo A. Lo? ?iciga, PhD, is Professor in the Department of Geography at the University of California, Santa Barbara, United States of America.